In 2009, during the 60th anniversary of the establishment of diplomatic relations between China and Russia, the presidents of the two countries reached a consensus on the hosting of a “Year of Languages”. In accordance with the program of the Ministry of Education, Dalian University of Foreign Languages undertook six of the twelve events concerning language education in the “Year of Russian”, including the establishment of The Center for Russian Studies at DUFL. The Center is a collaborative project between the Russian World Foundation and DUFL under the framework of the first-session protocol of the Sino-Russian Cooperation Committee. On October 10, 2009, Mme. 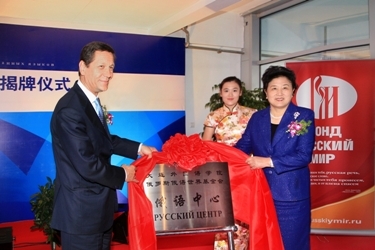 Liu Yandong, a member of Politbureau of the CPC Central Committee and State Councilor, and Deputy Prime Minister of Russian Federation, Mr. Alexander Zhukov, jointly inaugurated the Center for Russian studies at DUFL, the first of its kind funded by the Russian World Foundation in Northeast China and the second in this country. Russian Ambassador Plenipotentiary to China, Mr. Sergei Razov, Director of Education of the Russian Federation, Mr. Brad Aliyev, Executive Chairman of the Russian World Foundation, Mr. Nicholas Romanov, the former Chinese Minister of Education, Mr. Zhou Ji, Deputy Minister of Foreign Affairs, Mr. Wang Guangya, Deputy Secretary-General of the State Council, Mr. Xiang Zhaolun, Deputy Minister of Education, Mr. Hao Ping, and leaders from the provincial government were present at the opening ceremony. The Center has been established to implement cooperation between China and Russia in education, to enlarge the platform for educational exchanges between the two countries, and to contribute to Sino-Russian friendship. As a major base of instruction and research in the Russian language and culture, the Center stresses the promotion and popularization of the Russian language and culture, and commits itself to promoting Sino-Russian cultural and academic exchanges. The Center has a collection of eleven categories of more than 1,000 volumes of Russian books, generously provided by the Russian World Foundation. They concern areas of Russian politics, economy, education, culture, sports, languages, literature, art, history, and geography. The collection includes encyclopedias and over 300 Russian audio and video items, including DVDs for instruction, Russian movies, and documentaries about Russian history and culture. As a multimedia teaching facility, the Center also offers twelve computers to facilitate Internet research for faculty as well as students. The Russian Center has hosted a variety of academic lectures and lectures on Russian Culture since its establishment. It is also a platform for academic exchanges between graduate candidates from both China and Russia, providing access to symposiums, Youth Forums and other academic exchanges. Students engage in enriching extracurricular activities such as Russian poem recitals, Russian cultural events, knowledge contests, Russian corners, and drama performances as well as participating in Russia Day, Russian Language Day, World War II Victory Memorial Day and other activities. Students have been sent to study in Russian universities, to attend summer camps, for short-term training in Russian, and for oral interpreting courses funded by the Russian World Foundation. The former president of Russia, Dmitry Medvedev, visited the Center in September 2010, and wrote a dedication, expressing his wishes for the growth of the Center. The Center also received an outstanding contribution award from the Russian World Foundation in 2011. DUFL’s focus on the internationalization of educational programs is embraced by the Center’s active expansion of all-round cooperation with Russia in all areas, including personnel training, scientific research, cultural exchanges and social services.